How Do I Get Bats Out of an Attic? 08.14.2007 - Everyone always wants to know how I go about getting bats out of an attic. Well it's a trade secret, so bugger off! What I mean to say is, I trained for two straight years on bat removal projects, and the variables in any particular job mean that there's no one way to tell a person how to do it. Basically, if you're a do-it-yourself type person, this isn't necessarily a do-it-yourself type project. Go ahead and rewire your house - you don't need an electrician. Go ahead and cut down that tree - you don't need an arborist. Clogged arteries? Go to Sears and buy the triple bypass kit for $29.95. But if you've got bats, I advise you not to do it yourself. First of all, it's not just your home and health at stake - there's also the welfare of the bats to consider, and I've seen too many botched home remedy attempts that have failed to solve the problem while succeeding at harming a few bats that I'd prefer to tell as many people as possible to trust the experts when it comes to bat removal. 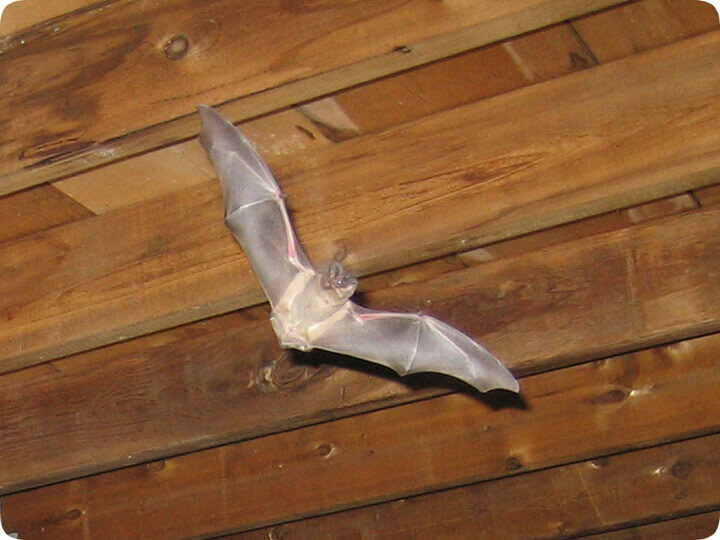 To get bats out of an attic, the principle can be pretty simple - just install one-way exclusion devices over the entry points and seal off all secondary points of entry, and allow the bats to leave on their own, but not return. However, as usual, this is easier said than done, and requires experience, knowledge of bat behavior, architecture, exactly how bats fly, and several other factors that a book could explain, but only hands-on experience can really teach. So if you've got bats in the attic, such as in the above photo from last night's work, give me or a local professional a call. This has been a public service announcement, sponsored by the wallets of Bat Removal Companies of America Associated. No seriously - I often do bat work at well under my normal wildlife removal rates, because I don't want to see these animals hurt.